A couple of weeks ago I have bought a nice Nikon D60 digital SLR camera, which came with two lenses, an 18-55mm and a 70-300mm. I am looking forward like a little child to trying out the big new lens at the next autocross event I go to this coming weekend. Should the shots come out nice, I hope I will be able to sell a few through my lulu.com storefront. So in order to make the customer experience a little more user-friendly I redesigned the front page to be cleaner and simpler, so that I can use it as an entrance page for any type of traffic: send the link to a design agency or give it to a fellow autocrosser, they should all be able to easily find what they came here to do. So here are the two designs. 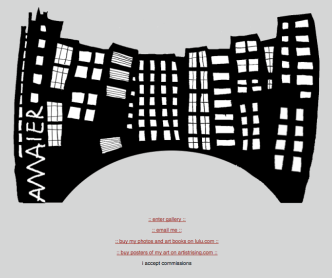 First the old, with the night cityscape and links to the user options below the large graphic. The graphic itself is linked to the gallery, but whenever I watched people try to navigate my site, they never clicked on the graphic, and scrolled down to the tiny text instead. Now here is the new design: definitely cleaned up and much more focused on the user, instead of personal artistic expression. Being an artist, I can say things like that. Artistic expression is great to the point until it stops your audience from actually seeing your art. And sadly, for many years my poor home page design stood in the way. Once the hurdle of coming to terms with the start page was cleared, the portfolio and the commerce pages were quite usable, but some of the initial good will was lost in the process. All these problems are solved in the new design. 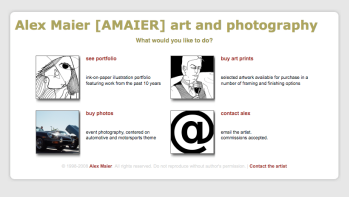 The user sees clearly the four options given by the page: You can either look at art, buy art, buy photos, or email me. At the same time, the new design is better at visually organizing all the options and informing the user about what else is there, besides what they came here to do. I have to admit that the pictures in the fist row (linking to portfolio and prints respectively) are not self-explaining without their captions. The photo and email pictures are much better, showing exactly what they represent. I will need to think about making the pictures in the first row of links speak for themselves. For those of you into this sort of thing, the gallery is powered by moderately-modified SPGM, Simple Picture Gallery Manager, an open source application released under GPL. The home page is simply a hand-edited static version of the gallery listing page. Art and photos are of course mine. In the next steps, I would like to clean up the commerce app running on amaier.net--potentially remove it altogether, since between lulu.com and artistrising.com I am mostly covered in terms of selling my work online. Indeed, the new layout is much better, the previous one with a big splash was just old-fashioned (and even back then when splashes were all the rage, they still were a bad idea). The only think I am not that happy enough is the active height of the front page, you have some little content at the top of the page and a lot of empty space at the bottom. If you don't mind the question: is the lulu store of any use for selling photos? I know it has that option, but are there buyers? What do you think about publishing some photos under a free license (CC)? Among other things (sharing, community, free culture) it may help getting visitors to your site and maybe also to the store. @nicu: Thank you for the kind words about the new design. Nice to see others confirming that I have done something right. As to your question about Lulu.com -- I would not see it as a primary way to sell art, more like an outsourced online commerce app that I use while I am the person responsible for promoting the content and driving traffic. I sold a few shots on Lulu from the British Car Show batch, actually, by distributing the link to the store directly to the car club members. About CC: Yes I probably could do that, and Lulu offers this license as well as free downloads, so I could make certain shots available for free as CC-licensed images. Maybe even make all content older than X months free, since most shots either sell on the spot or never do. definitely clearer navigation. i don't think you have to give up the artsy-ness, though... could be flourishes in the background, around the edges, etc. @luke: Of course you are right to make the point that artistic stuff can be re-introduced in a less distracting way. For me, I think the current design is close to perfect, because I am all about elegance and minimalism. Look at the Google search page--it does not get any better than that. At least in my world it doesn't. While I agree about the benefits of simplicity and think flourishes would be too much, having a favicon for the website would be really a professional touch and maybe a graphic logo in the hearer will not hurt. @nicu: Good idea with a favicon. Somehow I just did not think about creating one. Thanks for the pointer! How do you like your new camera? I've been considering an upgrade to my point-and-shoot that I usually carry with me and I wanted something that was real nice. @eric: I totally love my new camera! I have posted the shots from last weekend's event on http://lulu.com/amaier -- these were shot in all-automatic mode, mostly in bursts at 3 frames per second, using the 70-300mm Nikkor zoom lens. I can definitely recommend the camera to anyone serious enough about photography. For casual photographer it would be an overkill to buy the big lens. It is large and heavy, and will make it hard for you to just drop the camera into your backpack wherever you go. The 18-55mm lens that comes with the Nikon D60 kit should be quite sufficient for most situations. Those are awesome pictures. I started doing some "better" photography in the last year or so and while my point-and-shoot is doing a better than normal job I'd like to do better. Oh, what do you know about doing time lapse photography? @eric: Thank you! I am glad you like my pictures :) They were a lot of fun to take and review--like being at the autocross again! As to web photo albums, I prefer to keep it simple and use third-perty stuff where I can get free service :) I have used Flickr for private photo albums in the past. My friends have had good experience with Ipernity though I don't know what their pricing model is. Both these sites have active photographer communities. I do not have any experience at all shooting time-lapse, sorry, sounds like a neat challenge to perfect your technique! Yeah, I've been using Picasa but I'm not sure if I like it or not. I'd like to do my own solution on my own web server but that may or may not be a lot of work that I may or may not have time for. Thanks for the info on the D60. I'll see where I can pick one up around Newport News. Maybe I can get some good photos when I go hiking in a couple of weeks.